The Ricky Gervais Guide to... THE ENGLISH. In this episode: Karl harks back to halcyon days; Ritzy crackers; the archetypal Englishman; weddings; Karl on cafe culture; help the aged; Ricky's royal etiquette; dung beetles and dead badgers; fair play and the crossbow; dragon slaying and tongue-grabbing; Steve's spectacles; and Ricky reads a Brooke. How facts take this team off into diverse discussions and explanations is absolutely hilarious. Its in decline, unfortunately Carl has lost the innocence that made his so engaging and brilliant. He has got full of himself in a way that exposes the mean-spirited sides of his personality. Now its just more London media, who are very satisfied with themselves, yapping. I like David Mitchell. I like David Mitchell. I like David Mitchell. I like David Mitchell. I like David Mitchell. I like David Mitchell. I like David Mitchell. I like David Mitchell. 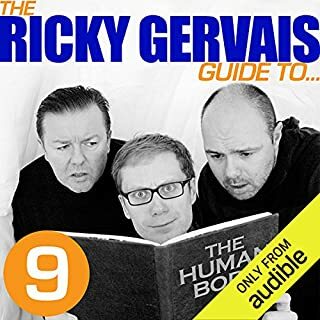 What about Ricky Gervais, Steve Merchant & Karl Pilkington’s performance did you like?